Srini Penchikala currently works as Software Architect at a financial services organization in Austin, Texas. He has over 20 years of experience in software architecture, design and development. Srini is currently authoring a book on NoSQL Database Patterns topic. He is also the co-author of "Spring Roo in Action" book from Manning Publications. He has presented at conferences like JavaOne, SEI Architecture Technology Conference (SATURN), IT Architect Conference (ITARC), No Fluff Just Stuff, NoSQL Now and Project World Conference. Srini also published several articles on software architecture, security and risk management, and NoSQL databases on websites like InfoQ, The ServerSide, OReilly Network (ONJava), DevX Java, java.net and JavaWorld. He is a Lead Editor for NoSQL Databases community at InfoQ. 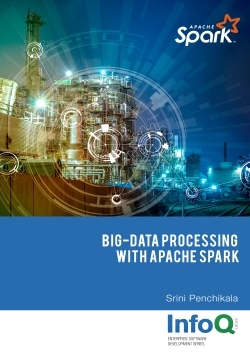 Apache Spark is an open-source big-data processing framework built around speed, ease of use, and sophisticated analytics. Spark has several advantages compared to other big-data and MapReduce technologies like Hadoop and Storm. It provides a comprehensive, unified framework with which to manage big-data processing requirements for datasets that are diverse in nature (text data, graph data, etc.) and that come from a variety of sources (batch versus real-time streaming data). Spark enables applications in HDFS clusters to run up to a hundred times faster in memory and ten times faster even when running on disk.